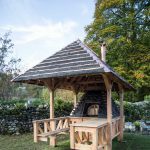 In the autumn of 2017, M ARCH: Architecture students could be found building a community bread oven and an information kiosk at the entrances to the Ruskin Museum in Coniston. 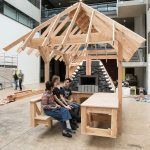 These structures took a year to design, develop and construct, and required many hands to make – both at Central Saint Martins and on-site in the Lake District. The project has recently been shortlisted for the annual AJ Small Projects Awards. Now in their 23rd year, the awards celebrate that ‘small’ scale of design which forms the core practice for many architects, as well as projects that allow practitioners to innovate and experiment, all with a budget of under £250,000. The shortlisted entry from Central Saint Martins and Hayatsu Architects was commissioned as part of The Road – an ongoing community engagement project based in Coniston in the Lake District, conceived by the non-profit arts organisation Grizedale Arts which will culminate in 2019 at the 200th anniversary of John Ruskin’s birth. 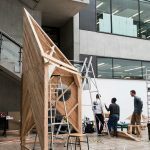 Taking on the project, Central Saint Martins’ M ARCH students collaborated with Spatial Practices staff Gregory Ross, Carlotta Novella and Takeshi Hayatsu – of Hayatsu Architects. The student’s initial eight proposal models were exhibited in Coniston, of which two were selected to be realised at full-scale – Freddie Wiltshire’s bread oven and Billy Adams’ information kiosk. 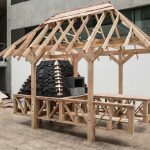 The fabrication of the two timber structures took place in summer 2017 at Central Saint Martins. 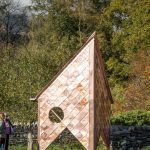 They were then transported to the Lake District and installed in situ in the grounds of the John Ruskin Museum. The initial proposals from Adams and Wiltshire were re-worked in collaboration with Hayatsu Architects, and constructing them formed the basis of Summer School, an annual six-week building workshop for M ARCH students, in which they experiment with materials, detailing and processes. Speaking on the collaborative nature of manufacture, Adams said “When we started Summer School it was no longer our individual project, it was everyone’s…and we got something much richer because of that.” During this process, each student developed a specialism – through trial and error, building up an understanding of processes to realise one particular aspect of the structures. 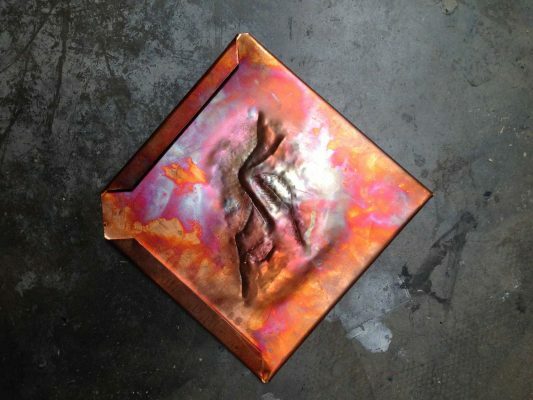 Through funding from the Coppermine Copper Project, copper was integrated into the design as cladding for Adams’ kiosk. More than simply clad the walls and roof of the structure, students devised packs of tiles and tools to send out to local partners, asking each to create their own repoussé design. Built from these community contributions, the copper façade of the kiosk takes on additional collective meaning. Grizdale’s project is a reworking of John Ruskin’s 1874 road-building project, which aimed to impart the notion of working for a greater good. Ruskin persuaded his then-students at Oxford University to help built a local road, promoting the benefits of collective action and satisfaction through labour – those taking part included Oscar Wilde and others who went on to become significant social reformers. In response, nearly 150 years later, Central Saint Martins’ students were encouraged to produce structural designs which engaged with the social reform of the Arts and Crafts movement. In the age of globalisation, climate change and development of digital technology, can the historical model of political and economic engagement, teach us anything about our lives today? The project not only encouraged students to explore the contemporary relevance of the movement, but also brought them into direct contact with its living history in Coniston, where Ruskin lived for the last decades of his life. The project has brought two permanent structures into being for the local community of Coniston but has also had lasting impact on the students involved. Adams and Wiltshire are now collaborating more formally, continuing to employ collective making within architectural practice as they head towards their graduation. The duo is working on a project in north London with locally-sourced materials and public clay tiling workshops as well planning a return trip to the Lake District to work with Grizedale Arts for a second time. Celebrating local material and history, past and present, the project connected students and community through functionality and making. The winner of the annual AJ Small Projects Awards will be announced on Wednesday 18 April 2018 during the launch event for an exhibition of all 20 shortlisted entries, at Feilden Clegg Bradley Studios in London. Community Bread Oven is currently on view at Hauser & Wirth as part of group exhibition The Land We Live In – The Land We Left Behind curated by Adam Sutherland, until 7 May 2018.